I’ve just found this very useful tool that allows you to compare words and phrases and how they are used online. It works very simply by taking the two words or phrases that you type in and searching through Google to give you the results for each word. It tells you which is the most popular and how many pages each one appears in. 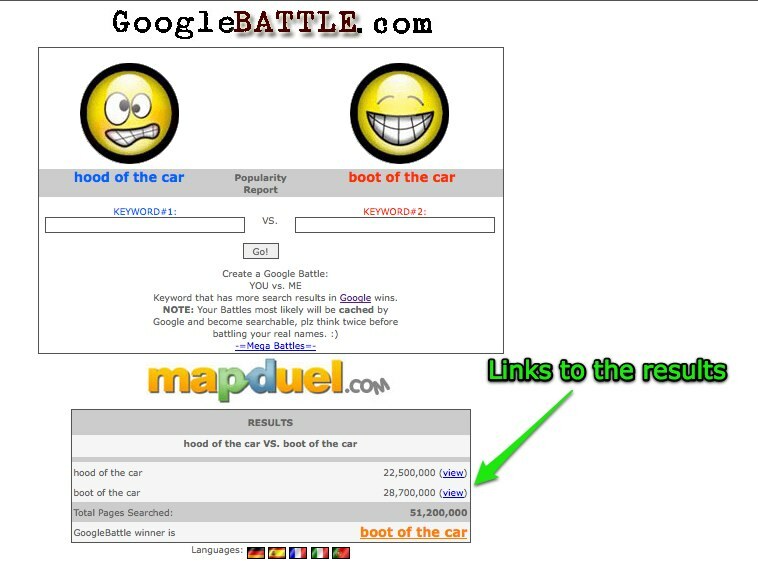 There are a few other tools around which can do a similar thing, but I prefer Google Battle, (an alternative is Google Fight) because it shows you a nice graphic of a smiling face and a sad face for the winner and loser, and because it also supplies links to the Google results, which means you can have a look at the context in which each word or phrase appears. This can supply valuable information about the way we use words in different contexts and their lexical grammar. 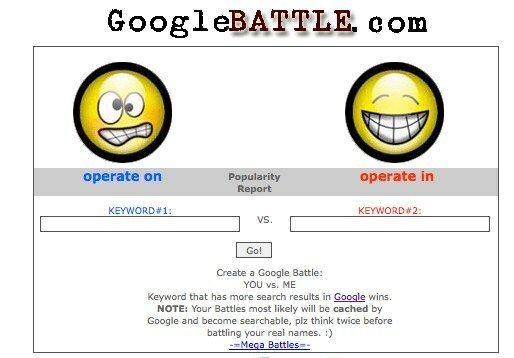 The very first result for ‘operate on’ shows that it is being used in a medical context. If you compare this with the first result for ‘operate in’ you can see the context is quite different and in this context it has a different meaning. By extracting these ‘real’ examples of the way the language is used and helping students to analyse and make deductions about the language we can help students to develop valuable autonomous learning skills. This is a great way for students to search and compare the use of prepositions when they aren’t sure which is the correct one to use. Likewise it can be really useful for checking collocations and the way they the different words and phrase are used, as in the ‘operate’ example I gave above. You could also use it to check word forms when checking the different parts of speech of a word. With word like ‘economic’ and ‘economical’ which are both adjectives, students can check to see how the different forms are used and when to use the correct one. Students could also use this to check different spellings of words to find out which is correct. When learning or teaching new vocabulary we could use this tool to extract examples of similar words being used in context. We could use these to create gap-fil sentences, cloze texts and other learning materials for students. We could get students to find real examples sentences which use the new words they are learning especially words with synonyms (slim, skinny) or words that have gradients, to see how the different words are used and when to use each one. We can get students to compare British and American words to see which is most popular. Students can compare the popularity of idomatic expressions like ‘Raining cats and dogs’ vs ‘Storm in a tea cup’. Students can search the results for two different words to find out which one has the most uses / different meanings. We can also use this tool for discussion warmers comparing popularity of things. Which of these do you think is most popular? Students can vote on which they think will win and why they think it will be most popular. This is a free and easy tool to use which gives you much of the power of a concordancer. Because it links in to Google it gives you access to vast amounts of information about the words. What I’m not so sure about? Because it links into Google to search examples from the internet, you can’t control what your students see in the results, so some of the results may link to inappropriate materials. It searches words within text, so it gives youy limited information about how the words are used in spoken language. 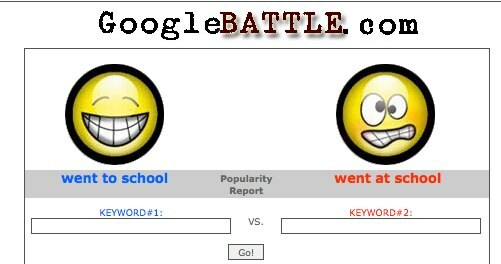 Well I hope you enjoy Google Battle and find it useful and if you have any other ideas for using it please do post a comment. I recently revisited Phraseum, an app which I first discovered and reviewed in March 2014. I’m glad to see that the tool is still around, has gathered a loyal following and has developed both in terms of design and functionality since that first review. In this article I’d like to show you some of the new features and also share some ideas for how you can use it. Let me start though by recapping what Phraseum does. Phraseum is a tool that students can use to capture lexical chunks, collocations and expressions while they read online text. It helps students to collect these expressions into theme based phrasebooks that they can then use to revise and share their learning. Within the platform there are also a number of features to help them learn the phrases, these include tagging of phrases and links through to Google translate. Phraseum also records the source of the phrase so that students can go back and find the phrases in their context. 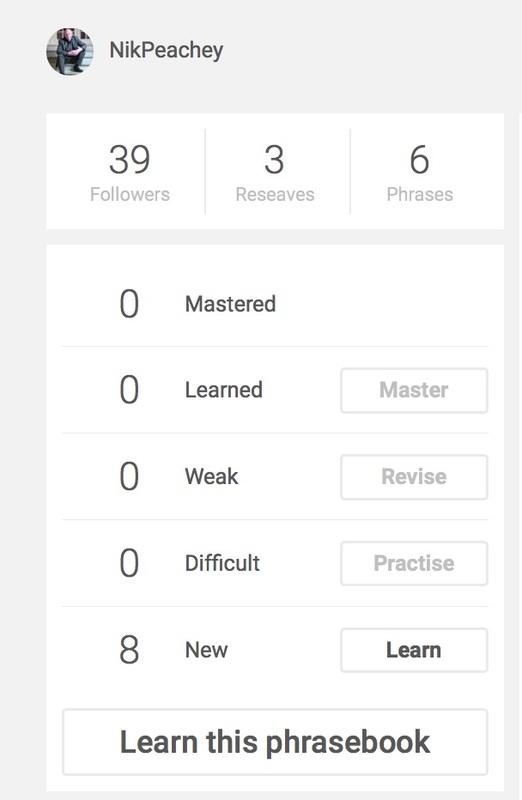 A new feature that’s been added since the last review is the ‘Learn’ feature. This is great as it helps them learn and memorise the phrases using a process of spaced repetition. To use this students just select a phrasebook and then click on the ‘Learn this phrasebook’ button. They can then select key words to remove from the phrases. After these have been clicked, they will have to select them in the correct order to put them back into the sentence. They work through the phrases doing this a couple of times and each time things get harder and more words are removed. Eventually the prompt words are removed and they have to type in the missing words. Once the students type in the words they will be able to compare with the original. Phraseum can also create revision tests so that the students re-study a selection of the phrases in their collection. When students have learned new phrases, each session begins with a test. This test is designed to identify exactly what they can remember. In each test they are required to type in phrases with minimal prompts. Their success in the test determines whether a phrase is learned or marked as weak and repeated again. As a teacher you can also create your own phrasebooks just by typing in the phrases you want stusdents to learn and then sharing the phrasebook with them. Once you have registered on the site, one of the first things to do is to add the ‘Clipping button’ to your browser. You can find it at: https://www.phraseum.com/page/clipping-button and just drag the button onto the bookmarks bar of your browser. Once you have done this all you need to do is highlight some text while you are reading and then click the button and it will open the clipping window which helps you to save the text chunk into the correct phrasebook and add tags and annotation to it. It’s also wise to decide how you want to organise the phrase you collect and create some empty phrasebooks too, then these will appear as options when you clip phrases from a text. Once you have done that you (or your students) are ready to start clipping as you read. Here are some activities you can do with your students to get them started with Phraseum. Choose a web based text that you would like your students to read. 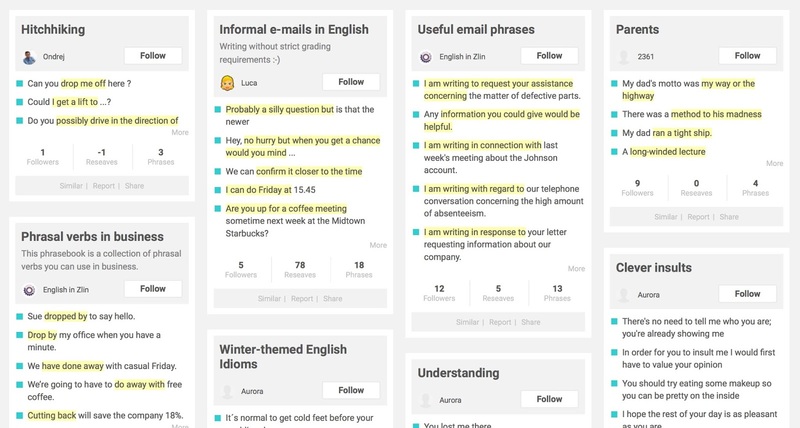 Collect phrases from the text into a phrasebook. Share the phrasebook with your students and get them to check their understanding of the phrases. 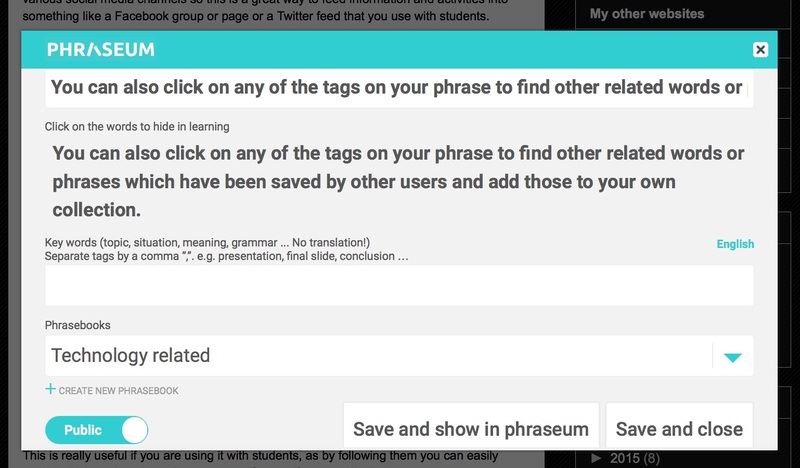 Ask the students to try to learn the phrases using the Phraseum ‘Learn’ feature. Once they’ve made an initial attempt to learn the phrases, get them to read the text. Give the students a web based text to read. Once you have completed comprehension and reading development activities ask the students to look for sentences in the text that have vocabulary, collocations or lexical chunks that are new to them and save the sentences into a phrasebook. Then get students to use the learn feature and choose the specific words from the phrases within the sentence that they need to learn. Students can then practice them regularly. When using a text that has a lot of dialogue such as a play, you can get the students to choose one of the people in the text and grab all the sentences they say into a phrasebook with that person’s name. They can then use the ‘Learn’ feature to try to memorise the lines of the text. You can then get the students act out or recite the text. Get students to collect wise quotes or sayings ( these could be based around a specific topic or just any that the students are interested in) once they have 5 to 10 quotes get the students to use the ‘Learn’ feature of the site to try to learn and memorise the quotes. Create or get students to create a phrasebook containing each of the lines from a short poem. They can then use the ‘Learn’ feature of Phraseum to try to memorise the complete poem.